As a lefty, many common tasks have been difficult my whole life. The two most common ones are cutting with scissors and writing with a pen and not getting ink on my hand. Recently, I found an awesome site for left handed people. It is called Lefty's San Francisco and sells all different products for lefty's like me. The crab claw mitt has heat resistant fabric on the bottom when used in the left hand. The Clauss kitchen shears are true lefty shears, with the blades reversed so lefties can see what they are cutting, and an ergonomically designed lefty grip. 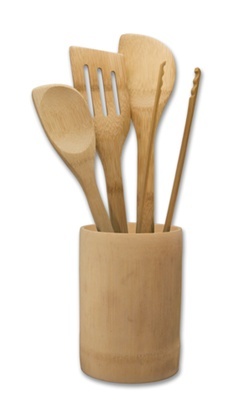 Bamboo tools are angled for lefty use, with the leading edge down when held in the left hand. The swivel peeler is ambidextrous. It's blades are sharpened on both sides, so that lefties as well as righties can peel either away from or towards themselves. The can opener turns counter clockwise, so that it goes around a can the reverse direction. Otherwise, lefties will have to turn the can rather than the opener. I love these products that I was sent! These all work great and I feel so happy to find some products that are easier for me to use. The kit that I was sent retails for $50 on the Lefty's website. 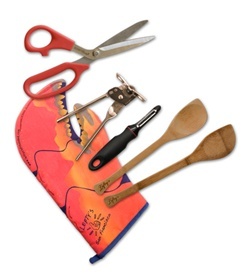 The giveaway will be for the Lefty's Bamboo Tool Set pictured above to one lucky reader of The Nutritionist Reviews. The giveaway is open until Midnight on Wednesday September 21st. Winner will be chosen on Thursday September 22nd using Random.org. The winner will have 48 hours to respond or a new winner will be chosen. Follow me on my new Twitter page. If you don't have Twitter, then visit the company's site and tell me what item you would like. -Enter any of my other current giveaways (1 entry for each giveaway). -Put my button on your blog and leave me the link where you did so (2 entries). I don't tweet so I really appreciate the altenate way to enter! I want to win this for my sister's birthday. She has always struggled being the only lefty in the family. I thought that the 7 Piece "I May Be Left Handed But I'm Always Right" Set was also very cute! I follow you on Twitter as hybroanglid! I don't have a twitter account but I would love the Left Kids set for my classroom!